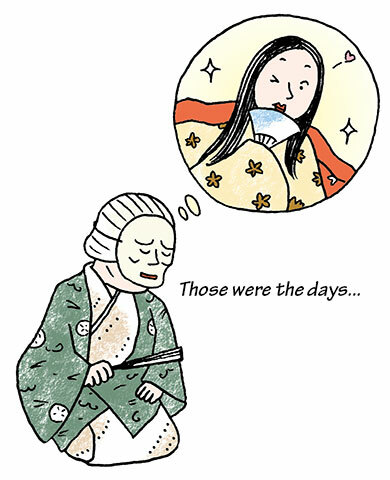 TRIVIA of Noh : Q146 : What kind of plays are suitable for old actors? | Home | Trivia | Q146 : What kind of plays are suitable for old actors? What kind of plays are suitable for old actors? There are some Noh plays on the subject of growing old. The typical examples are pieces featuring elderly women, including “Sekidera-komachi” and “Higaki”. Those plays tend to have similar story patterns in which the women recollect their younger age when they were beautiful. Ono no Komachi is a legendary beauty in the Heian period, but she appears in many Noh plays as an old woman. The plays featuring old women are unexceptionally deemed to be masterpieces for which higher skills are required. Actors do not necessarily have to be old to perform such plays because they wear masks. However, those plays are naturally performed by elderly actors. Though plays featuring elderly women have been valued while they contain such contradiction, there are limited opportunities to perform them because they are masterpieces. Most of those plays are simple and less dramatic, while being on the subject of serious matters. They challenge the actors’ ability to express themselves, as well as the appropriate appreciation by the audience. Apart from the plays featuring elderly women, ones in trilogies are deemed for experienced senior actors, because most of them are serious plays that require special initiation. Some examples are the three plays featuring warriors (aka San-Shura: “Tomonaga”, “Sanemori” and “Yorimasa”) and the three featuring noble women (aka San-Fujin: “Yokihi”, “Teika” and “Ohara-goko”).